Kelowna Mortgage Broker and The IKEA Monkey? 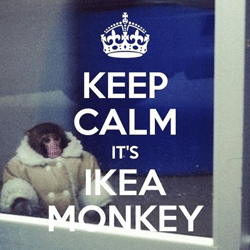 I like the Ikea monkey. I like his coat. I like that he hangs at Ikea. He’s kind of a euro-hipster monkey out shopping for monkey size furniture and stuff at one of our favorite furniture stores. So why is the Ikea monkey on my mind this morning? Well, while I was out walking Jack earlier it occurred to me that the Ikea monkey connects to our psyche in a fundamental way. Much of this blog talks about the abstract and arcane world of economics with the context of mortgages and real estate. The topics, because they are abstract, don’t connect to our inner humanity. Abstract ideas are always a bit tough to follow but we feel we need to understand them so we can make good financial decisions. What’s a good financial decision? One where we either make money or at least don’t lose money. How do we make a good decision? We try to learn as much as we can about a subject by thoroughly researching it and then hopefully making an educated decision. In the context of real estate the decision almost always revolves around the question, is this a good time to buy? When is a good time to get a Kelowna Mortgage. In my short 35-year career in this Kelowna Mortage industry I can tell you that no one can predict with100% accuracy when is a good time to buy a house. I can tell you that over the long term real estate prices follow the inflation rate. Sometimes they fall behind, like now in Kelowna, and some times they get ahead, like 2007 in Kelowna. Contact us for more information about a Kelowna Mortgage. I can also tell you that home ownership is in demand. Which brings me back to the Ikea Monkey. Owning your own home, like the Ikea monkey, touches something deep within our psyche. It is not an abstract idea. Therein are the difficulty and the solution. If you want to own a home then buy a home. A home is not an investment. If you don’t want to lose money be prepared to live there for the next 10 years and inflation will save your investment. Your home is not an abstract idea, like the Ikea Monkey, it’s close to your heart. Hopefully we get an Ikea here in Kelowna soon.